As a freshman, his courses were so eclectic that he soon wound up on academic probation. He recovered and persisted, attaining a B.A. in an elective program best described as comparative literature in three years, and an M.A. in English literature in the fourth. In December 1908 a book Eliot found in the Harvard Union library changed his life: Arthur Symons's The Symbolist Movement in Literature (1895) introduced him to the poetry of Jules Laforgue, and Laforgue's combination of ironic elegance and psychological nuance gave his juvenile literary efforts a voice. By 1909-1910 his poetic vocation had been confirmed: he joined the board and was briefly secretary of Harvard's literary magazine, the Advocate, and he could recommend to his classmate William Tinckom-Fernandez the last word in French sophistication--the Vers Libre of Paul Fort and Francis Jammes. (Tinckom-Fernandez returned the favor by introducing Eliot to Francis Thompson's "Hound of Heaven" and John Davidson's "Thirty Bob a Week," poems Eliot took to heart, and to the verse of Ezra Pound, which Eliot had no time for.) On the Advocate, Eliot started a lifelong friendship with Conrad Aiken. 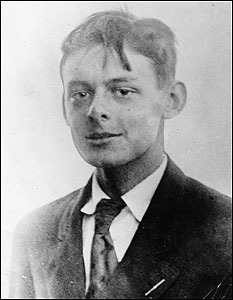 In 1906 Eliot entered Harvard University. He served on the staff of the Harvard Advocate, the university's literary journal, in which he first published parts of "The Love Song of J. Alfred Prufrock." He completed his undergraduate studies in 1909 and his master's degree in English literature the following year.